Last month I was on a plane flight when the person next to me spilled an entire glass of wine on my Dell Precision M4500. I was told the cost of repairs would be too high – about 1/2 what it would cost to by the new machine I ended up buying Before my new machine arrived I ended up with two other devices – a Microsoft Surface RT (ARM based), and an upgrade from the Nokia Lumia 900 Windows Phone to the Nokia Lumia 920 – very nice. The new laptop I got was the lenovo X1 Carbon – a 2.99 pound machine (I guess 3 pounds with the SD card in it right now) with 8GB RAM, 256 GB Solid State Drive, and an Intel i5 3427U CPU. I decided to step down from my previous i7, but this new generation still seems faster. I was making the tradeoff so that I could have longer battery life. So I mentioned the “sacrifice” of lower CPU for better battery life, yet the overall performance seems better. 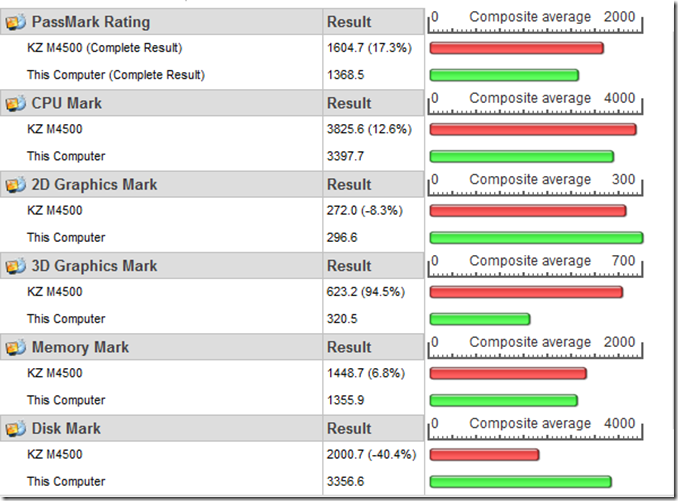 Here are the PassMark ratings (great program I purchased) that compare the Dell that died of alcohol poisoning with the new lenovo. I don’t do much with 3D… The real highlights are the disk performance. 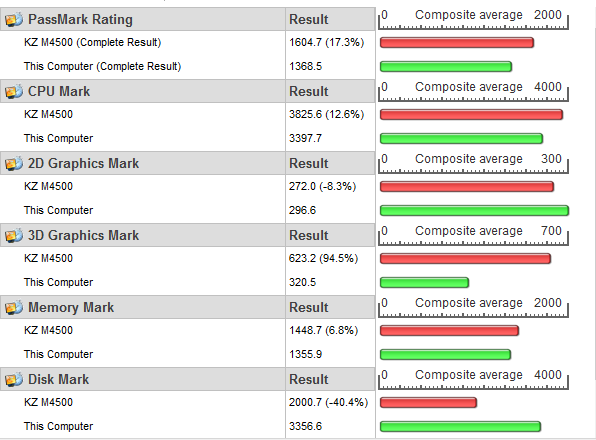 With 12% lower CPU the 40% improvement in disk performance outweighs that giving me overall better performance. So now I understand why this isn’t feeling much like a sacrifice. So what do I like about my X1 Carbon? So at this point, the same should be said about the Mac Air – so why the lenovo? In a word – Green. Apple might have changed, but I found MANY quotes such as this when researching: “Additionally, although battery runtimes have increased to the point that many may no longer need to swap batteries, those who value this ability highly most likely would prefer to purchase a notebook from a company other than Apple.” There’s even a warranty plan that includes a battery change. So now the Microsoft Surface…. What do I like about it? There are tons of reviews on this, but I’ll just hit what I like… The size and the keyboard. I was able to be productive on a plane again. Let’s face it… the days of being able to pull out a normal laptop when in coach are long gone. I don’t see that being reversed. So what’s the solution? You’ll need to have a smaller device that will fit in the very limited space the airlines give you. As usual, the person in front of me on a recent flight felt the only way to get your seat to go back is to do a full body slam against the seat (drives me nuts). Missed my surface by almost 2 inches – yet I was typing comfortably. The battery life. My lenovo is pretty good, but the Surface is even better. There were lots of nice changes to Windows Phone 8 and that’s what’s on my Lumia 920. There are plenty of reviews in this as well, so I won’t say much here – just that I’m really enjoying the phone. One site that leads here is JoyOfExcellence.com. So I try to point to excellence more than to the lack there of. However Dell dropped the ball many, many times over the past 6 months and the repair fiasco was the final straw. It has been more than 14 years since I purchased a personal notebook other than Dell. But now I’m with lenovo and so far see why all the lenovo user’s I’ve encountered are so loyal. Farewell Dell. This entry was posted on Sunday, November 11th, 2012 at 2:48 pm and is filed under Technology. You can follow any responses to this entry through the RSS 2.0 feed. You can leave a response, or trackback from your own site. 41 queries in 0.218 seconds.